It is with great sadness that I inform you of the passing of the one and only Benny Gordon, who died on Christmas Eve of complications rising from an inoperable stomach tumor. 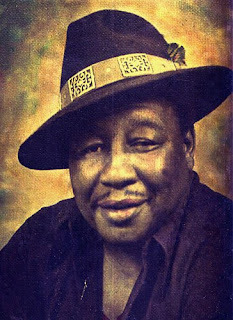 His funeral will be held today at 1 pm at the Hampton District 2 Auditorium in his home town of Estill, South Carolina. My heartfelt condolences go out to his family. He grew up in the small town of Estill, South Carolina down along the Columbia Highway, and started a band with his brother Sammy on guitar. Originally a Gospel outfit, they called themselves Benny Gordon and the Christian Harmonizers. According to Benny, their song Brightly Bean was a huge hit, and put them 'on top' in the Gospel field. That song led to an appearance at the Apollo Theatre in Harlem, which would become "the only gig I ever got fired from! ", says Benny. They were apparently just tearing the house down, and the local headliner complained to Joe Crain (the Apollo's booking agent), and refused to follow their act. Joe sent them packing! Benny soon saw where the money was, and moved to Brooklyn, where he and Sammy crossed over and formed the infamous "Soul Brothers". 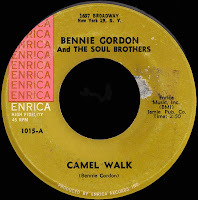 Their first record was the legendary Camel Walk on Teddy McRae's New York based Enrica label, which became somewhat of a local hit in 1962. It becomes difficult to sort out the labels he recorded for at this point (as Benny said himself, "I don't think I missed any of 'em! "), but great records on Wand (please see The A Side), RCA, Shadow, NewMiss, Phil LA of Soul (and more) would follow. The incredible Give A Damn (About Your Fellow Man) has become a Funk favorite, and his version of J.D. Bryant's (Get It) Come And Get It is a much sought after slab of dynamite as well. We talked for awhile about New York soul, and how it never got the press it deserved, which led to the subject of Bobby Robinson. Bobby was the king of the whole scene, according to Benny, and there didn't seem to be a time when he didn't have a hit on the R&B charts. J.D. Bryant used to hang around in Benny's basement in Brooklyn while he rehearsed with Sammy and the rest of the Soul Brothers, and they "shared quite a few drinks" together. 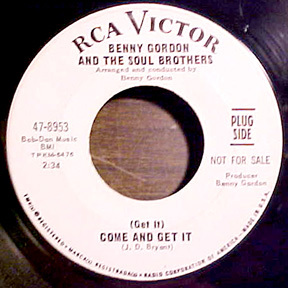 If you take a look at the publishing credits on the lousy ebay scan of 'Come And Get It' above, you can make out that it was published by 'Bob-Dan Music', which was of course owned by Bobby Robinson and his brother Danny. More evidence of the existence of New York Soul! Even back in the sixties, Benny realized that there was money to be made in the "white market," and the Soul Brothers soon became the house band at Trudi Heller's legendary discotheque and club on Sixth Avenue in Greenwich Village. Frequented by all the 'glitterati' in town, Trudi's gave them exposure they just wouldn't find anywhere else. 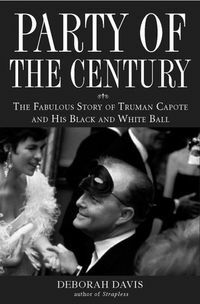 It seemed only natural, then, that Truman Capote would turn to Trudi to provide the entertainment for his legendary Black And White Ball, otherwise known as the Party Of The Century. With all of New York (as well as Hollywood and D.C.) vying for an invitation, Capote ruthlessly selected 500 guests to attend the extravaganza at the Plaza Hotel in 1966, with music provided by the Soul Brothers. Benny said they were "really gettin' down heavy", when he noticed Frank Sinatra heading for the stage! He wasn't sure what to expect, but when 'Old Blue Eyes' got up there he told him, "Boy, go ahead and sing them blues - blow their minds!" Can you imagine? "His eyes were really blue!," Benny told me. A South Carolina legend, we will talk more about Benny in the days to come. I only have one record by Benny Gordon and didn't know about any of this! I need to delve deeper in to New York soul now that I live in BK. Any idea if J.D. Bryant is around? We gotta get him back on stage! Very sad to read this. 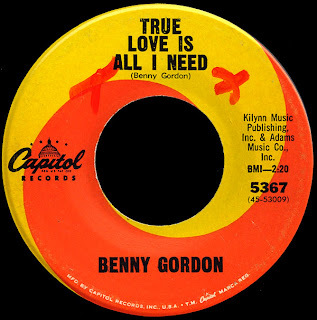 I did a piece on Mr Benny Gordon for UK magazine "Soul Up North' a couple of years ago and information was a bit difficult to find then. That Truman Capote story is just great ! RIP Benny, and thanks for the pleasure your music gives me. Thanks for the article on my dad BENNY GORDON. Thanks to you I was able to hear some of my dads music for the first time. God has to bless you for the seed you have sown. My dad BENNY GORDON loved making music and entertaining. I can still hear some of the songs that he loved to sing around the house or to me in my head. Hell Mr.Reed. J.D. Bryant is my grandfather and he is alive and well. I think he would love to be back on stage. I loved hearing his music growing up. Sorry to say but JD GORDON has just passed away this week of November 14,2016 in Clinton,N.C. He was 78 and had been staying in a nursing home when he passed. Sorry to hear of the loss of your grandfather.